Unused drugs that are flushed contaminate the water supply. 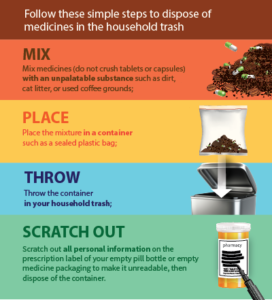 Proper disposal of unused drugs saves lives and protects the environment. Arlington County Police Department – 2000 block of 14th Street N.
Items accepted at the drug take-back boxes are prescriptions, vitamins, prescription ointments, pet medications, prescription patches and over-the-counter medications. Items not accepted are needles, inhalers, aerosol cans, thermometers, lotions or liquids and hydrogen peroxide.